Daphne Cote, Artist: Finally Finished! It's finally finished! I am quite sure I have put more than 20hrs into this painting. Though it is not that large it has so many different colors in it. It was the color mixing that really took the time. This painting really put my color mixing skills to test. It was not easy but I learned an incredible amount. I will certainly think again before picking subjects that are so colorful. I am pleased with the results. I love looking at this painting. There is so much to it. I picked the subject because it was colorful and also because by enlarging it's scale it reminded me of abstract paintings where the main point is shape and color. 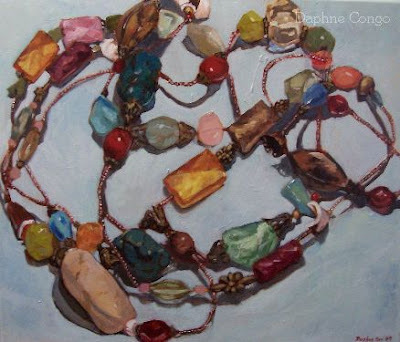 In this painting I paid as much attention to the beads as I did the negative space around the beads. it is the color and shapes that make it what it is. Though, you cannot experience it on your screen, the size of the work contributes to its abstract feeling. If it was a realistic size that was more true to the subjects actual size it wouldn't be as successful a painting. That is my personal opinion. I keep in mind that art is subjective. Speaking of opinions, my mom likes it. So it must be good! it is incredible and my hat is off to you for the complicated subject matter and the fantastic execution. Slammin' painting, Daphne. Thank you very much. I haven't received many comments lately, so I really appreciate you taking the time to do so. It really boosts me up.